Hand (Shut-off) valves are used for turning air pressure on and off for pneumatic devices. 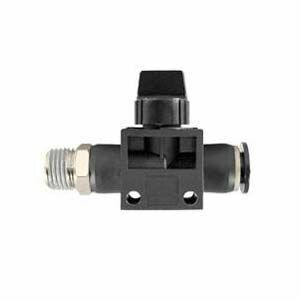 The three-directional control valve, when closed, discharges the residual pressure from the output side (device). Therefore it assures safety at adjustment or repair of the connected devices. The two-directional control valve does not have air discharge mechanism, is suited for air supply to a tank or other devices from which the residual pressure should not be discharged. The two-directional control valve is also suited for the system where vacuum piping is used.